Authors of the paper in Science Advances (reference ). 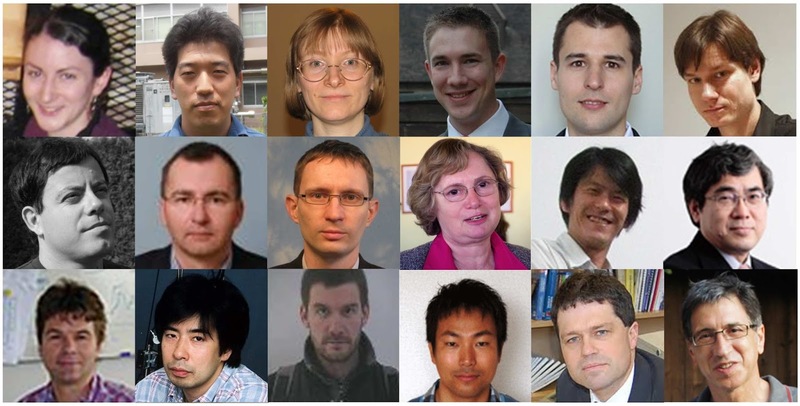 Left to Right: (top row) R. H. Zadik, Y. Takabayashi, G. Klupp, R. H. Colman, A. Y. Ganin, A. Potočnik, (middle row) P. Jeglič, D. Arčon, P. Matus, K. Kamarás, Y. Kasahara, Y. Iwasa, (bottom row) A. N. Fitch, Y. Ohishi, G. Garbarino, K. Kato, M. J. Rosseinsky, K. Prassides. In our recent work, published in the journal Science Advances , we have addressed the relationship between the parent insulating phase, the normal metallic state and the superconducting pairing mechanism, a key challenge for all unconventional superconductors, in a series of chemically-pressurized fulleride superconductors. This work has revealed a new state of matter straddling the Mott insulating and Fermi liquid states at the two extremes of the phase diagram: the Jahn-Teller metal, where localized electrons on the fullerene molecules coexist with metallicity. 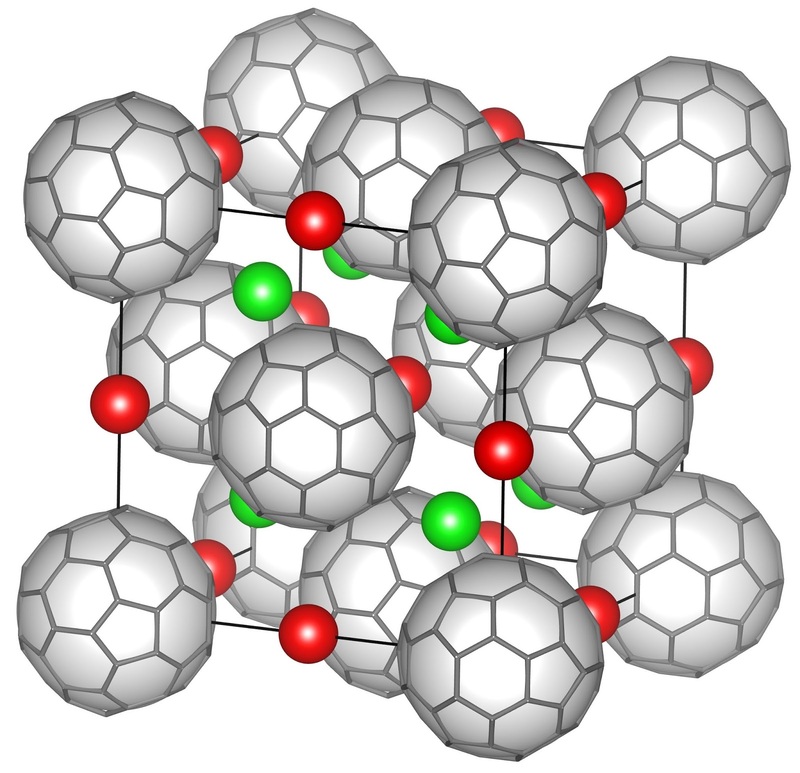 Figure 1: Crystal structure of face-centred-cubic A3C60 (A = alkali metal) with C603- anions in grey, and the alkali metal cations in colour; reproduced from ref. .
Alkali metal intercalated fullerene compounds with the stoichiometry A3C60 (Fig. 1) are superconducting, with the highest superconducting Tc found in a molecular material being 38 K in pressurised Cs3C60 . This material is an unconventional superconductor; however, its Rb analogue, Rb3C60 exhibits conventional superconductivity. The question arises how the two types of behaviours are related both in the normal and in the superconducting state. The nature of the normal state from which the highest Tc emerges is also of key importance. In order to address these questions, mixed bulk superconducting salts of C60 were prepared with compositions RbxCs3-xC60 (0 < x < 3) . In the isostructural face-centred-cubic- structured phases of this compositional series, tuning the ratio of cations with different diameters controls the distance between C603- anions, without the need to apply external pressure, thus permitting a wide range of measurements to be employed. Variable temperature high-resolution synchrotron x-ray powder diffraction, SQUID (superconducting quantum interference device) magnetometry, nuclear magnetic resonance (NMR), infrared (IR) spectroscopy and specific heat measurements were undertaken. When the intermolecular separation is large, like in Cs3C60 at ambient conditions, the electrons of the C603− anions cannot hop from one site to the other, and the material is a Mott insulator (Fig. 2). Electrons localised on the C603- anions couple to intramolecular vibrations leading to the distortion of the molecule . The Jahn-Teller distortion removes electronic as well as vibrational degeneracies. The latter results in splitting of vibrational lines in the IR spectrum, which provides an excellent way of detecting the Jahn-Teller effect. 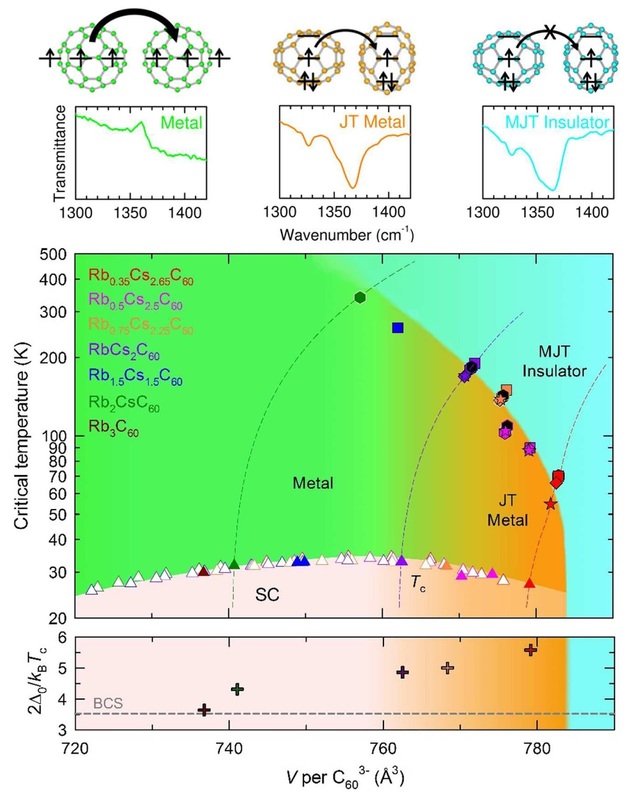 Thus the parent insulating state of A3C60 superconductors is a Mott-Jahn-Teller insulator, as has previously been demonstrated through IR spectroscopy for the most expanded member Cs3C60 . Figure 2: The different electronic phases encountered in RbxCs3-xC60 fullerides ranging from the conventional metallic (green) through the Jahn-Teller metallic (orange) to the Mott-Jahn-Teller insulating regime (cyan). The top two rows show schematics of the molecular geometry together with the molecular electronic structure determined by the Jahn-Teller effect and the most characteristic region of the infrared spectrum. The middle panel is the electronic phase diagram; symbols represent the insulator-to-metal transitions and the superconducting Tcs as a function of the volume occupied by a C603- anion, which is increasing as the intermolecular distance increases. The lower panel shows the variation in the superconducting gap normalised by Tc. Figure reproduced from ref. .
Decreasing the intermolecular distance from this state allows the hopping of the electrons, yielding metallicity. Thus an insulator-to-metal transition, or crossover, is observed on increasing the proportion of the smaller Rb+ ion in the material (Fig. 2). Signatures of this transition from the experimental techniques deployed include anomalous shrinkage of the unit cell size, cusps (or maxima) in the magnetic susceptibility and temperature-normalised spin-lattice relaxation rates as a function of temperature, and a step-wise decrease in IR spectral background transmittance. However, the metallic state encountered close to the metal-insulator boundary is not conventional; the electrons are not forming the conventional bands of a Fermi liquid. Electron correlation results in some persisting localised features in the electron system, like the continued presence of the Jahn-Teller effect as evidenced by IR spectroscopy. The coexistence of the molecular Jahn-Teller effect with metallicity is reflected in the designation of the newly observed phase as a Jahn-Teller metal. The further decrease of intermolecular distances leads to the gradual disappearance of the localised features, like e.g. the Jahn-Teller effect, until a conventional metal is encountered in Rb2CsC60 and Rb3C60 (Fig. 2). When the electrons are delocalised over the whole crystal to provide a conventional band, they cannot induce Jahn-Teller distortion any more . A similar crossover between the unconventional and the conventional behaviour is also present in the superconducting state. The superconducting gap probed by NMR spectroscopy at large intermolecular separations is much larger than that of conventional BCS (Bardeen, Cooper and Schrieffer)-type weakly-coupled superconductors (Fig. 2). As the localised character of the electronic structure fades away gradually with decreasing intermolecular distances, the size of the gap returns to the value characteristic for conventional superconductors. Decreasing the intermolecular separation in the unconventional region leads to a rise in Tc , while it leads to the long-known decrease in the conventional region. Thus the highest Tc emerges where the molecular and extended properties of the electronic structure are balanced. The observed behaviour shows how the superconducting Tc can be tuned in fullerides, paving the way for the preparation of other molecular superconductors with enhanced Tc. Establishing the whole phase diagram of face-centered-cubic A3C60 superconductors and tracking the transition between conventional and unconventional states can provide important clues for the understanding of high-Tc superconductivity in other materials, as well. Our results are also expected to stimulate the development of improved theoretical descriptions of the A3C60 system , further advancing our understanding of the origins and mechanism of superconductivity in other strongly-correlated high-Tc superconductors. Ruth H. Zadik, Yasuhiro Takabayashi, Gyöngyi Klupp, Ross H. Colman, Alexey Y. Ganin, Anton Potočnik, Peter Jeglič, Denis Arčon, Péter Matus, Katalin Kamarás, Yuichi Kasahara, Yoshihiro Iwasa, Andrew N. Fitch, Yasuo Ohishi, Gaston Garbarino, Kenichi Kato, Matthew J. Rosseinsky, Kosmas Prassides, “Optimized unconventional superconductivity in a molecular Jahn-Teller metal”. Science Advances, 1, e1500059 (2015). Abstract. Alexey Y. Ganin, Yasuhiro Takabayashi, Yaroslav Z. Khimyak, Serena Margadonna, Anna Tamai, Matthew J. Rosseinsky, Kosmas Prassides, “Bulk superconductivity at 38 K in a molecular system”. Nature Materials, 7, 367 (2008). Abstract. Gyöngyi Klupp, Péter Matus, Katalin Kamarás, Alexey Y. Ganin, Alec McLennan, Matthew J. Rosseinsky, Yasuhiro Takabayashi, Martin T. McDonald, Kosmas Prassides, “Dynamic Jahn-Teller effect in the parent insulating state of the molecular superconductor Cs3C60”. Nature Communications, 3, 912 (2012). Abstract. A. Wachowiak, R. Yamachika, K. H. Khoo, Y. Wang, M. Grobis, D.-H. Lee, S. G. Louie, M. F. Crommie, “Visualization of the molecular Jahn-Teller effect in an insulating K4C60 monolayer”, Science, 310, 468 (2005). Abstract. 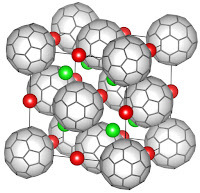 Yusuke Nomura, Shiro Sakai, Massimo Capone, Ryotaro Arita, “Unified understanding of superconductivity and Mott transition in alkali-doped fullerides from first principles”, arXiv:1505.05849v1 [cond-mat.supr-con] (2015).